Generation and validation of the NOX5-KI mouse. (A) Representative schematic of the humanized NOX5 mice. 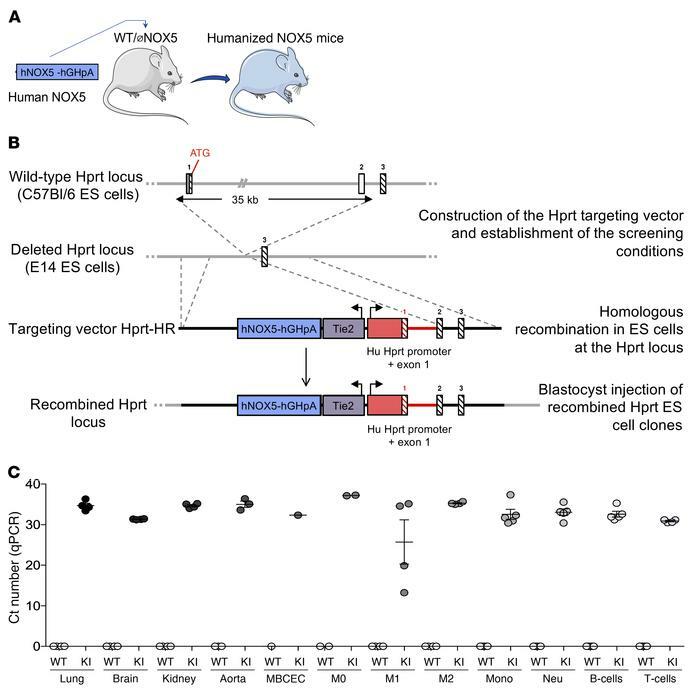 NOX5 gene located on the X chromosome results in females with a double copy of the gene (NOX5-KI/KI), while gene load is half in male mice (NOX5-KI/Y) (B) Construction of the humanized NOX5-KI mice. First, WT and deleted Hprt constructs are shown. The targeting vector to insert NOX5 (human NOX5 cDNA, blue box) was coupled to the human Hprt promoter (red box) and exons 1 and 2. The human Hprt promoter is under control of the Tie2 gene (purple box) to create NOX5 expression. Hatched black and red boxes represent murine and human Hprt exons, respectively. Solid line represents intronic sequences. (C) NOX5 gene expression was measured by qPCR (Ct) in different organs (lung, brain, kidney, aorta, and mouse brain capillary endothelial cells [MBCEC]); macrophages from bone marrow (undifferentiated [M0], inflammatory [M1], and active [M2]); and hematopoietic cells isolated from spleen (monocytes [Mono], neutrophils [Neu], B cells, and T cells). Tissues from WT mice did not show NOX5 gene expression, while significant expression was detected in NOX5-KI mice. Ct values of n = 4 are shown.